"Who is dem people? What race dey running?" 'There were always two Carnivals in one: the Carnival of the elites and citizens of substance, and the "jamette" Carnival of the masses' "Carnival today, conceptually, is largely middle-class, feminine and white." Twenty years ago in 1979, writing for the Vanguard newspaper, we advanced that view. Ironically, that was the very year of the "no pan" action when the steel-band movement, in dispute with the CDC, boycotted the Savannah and Desperadoes, lead by the unpredictable, enigmatic Rudolph Charles, broke the boycott. They were the only steelband that did so on the grounds and pretext of some obscure, illogical "responsibility to the people." Since then, the trends that emerged within the process of commercialising Carnival have been crystallised. The point to note, though, is that these very trends have always existed at the centre and core of the genesis of Carnival. There were always two Carnivals in one: the Carnival of the elites and citizens of substance, and the "jamette" Carnival of the masses. In the days of yore, the elites and middle class expressed themselves in the masquerade balls under the patronage of the governors, while the masses sought to "mimic" them in the streets. Much of our traditional Carnival street characters like "Dame Lorraine" and "Burrokeet", it has been suggested, emerged out of such mimicry. When the masses paraded in the course of their "jamette" Carnivals, the elites and middle-class were known to have been keen observers from the safety of their lofty balconies; then later they came down to play mas on the backs of trucks; then they actually came down into the streets but cordoned themselves off from the plebs by use of ropes; finally they came to control and design their own bands, taking over Carnival, while consistently pushing the Carnival of the masses back, seeking to limit their input of the mass of people. Today we are confined to ole' mas on J'ouvert morning, the infrequent appearances of impoverished steelbands on the road, and the road-side DJs. It is not the view here that someone with a master plan worked out all this and implemented it successfully. Absolutely not! Objectively, the commercialisation of Carnival with the impact of million-dollar investments dictated certain structural and conceptual change and ruled out the poor and the dispossessed who before, in order to be "kings" for a day, made mas literally out of nothing. Bones used in the portrayal of African and some red Indian masquerades were the actual bones of dead dogs buried months before Carnival. Hair and wigs were made from dyed, stripped rope; shields and such metal-like paraphernalia were Coca-Cola and Carib advertisement signs ripped from the lamp-posts, and so on. The people always found the inexpensive way to create their mas. Not all these ways were in fact legal. The point to be made is that all masqueraders, except the kings and queens of bands, made their own costumes at home. Men "bent their own wire" and made their own "papier-mach" moulds, while the shoemakers and other artisans in the communities made items like boots. The commercialisation and middle-class stratification of the Carnival coupled with the massive involvement of women as today's masqueraders changed all that. Women, now approximately 98 per cent of all mas players, go to band yards, that are now massively centralised production centres or factories, to pick up skimpy "danskin" tops and bottoms and a standard for as much as $900 (TT). The process has robbed Carnival of its creativity and now we are faced with a sickening sameness year after year. True to say, in the Carnivals of yesteryear, the steelbands were central and spearheaded the creative trust of Monday and Tuesday mas. The glorious days of this era brought the creativity of our people to its heights with bands like Dem Fortunates (Belmont); Cult of the Crocodile, Snow Kingdom and Noah's Ark (Desperadoes); Glorification of Spain (All Stars); Gulliver Travels (Silver Stars); Legends of Valhalla (Renegades) and so on. Moving back then with huge numbers, the steelbands would, at times, be forced to move aside to allow the comparatively small fast-moving, almost galloping, middle-class bands to pass. Their then amazing rate of speed was always the topic of great amusement. "Who is dem people? What race dey running? ", we joked among ourselves, laughing at their seeming, pompous strangeness; now the reverse is the case. The decibel levels to which people have now become attuned has technologically set back the steelbands. We were able before to hear the "bases" of Rupert and Gordon of All Stars, way back at the end of the 5,000 to 6,000-strong band of sailors. That is no longer possible today given the decibel levels raised tenfold by the new electronics and the banks of huge speakers. Putting steelbands in huge trucks plus forms of simple amplification have been measures introduced to deal with the constraints faced by steelbands. As the middle-class bands, by share force of money and commercialisation, assumed gargantuan proportions, the steelbands have found themselves fighting to maintain pride of place and space in the Carnival process. For the past two decades, they have continually complained to the Carnival authorities that the steelbands only serve to deter their free movement and have persistently advocated that steelbands be confined to limited areas. That view has culminated with the demand this year for a special day for pan on Carnival Sunday. We must, most vehemently, reject any such notion. It is not the steelbands that are to be blamed for the bottlenecks. On the contrary �it is the continued idiocy of confining competition to a stage that brings the colossal nightmare. 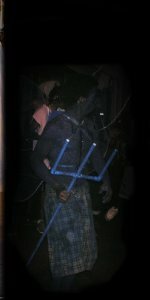 For quite some years, there has been a growing groundswell of opinion that steelbands should join together to achieve, once again, "critical mass" to, firstly, maintain their "space" in Carnival, and, secondly, to deepen and extend its cultural significance together with calypso as the pivot of the theatre of the streets. We must never give up any ground. We must parade on every day of Carnival and never accept any confinement in accordance with the middle-class agenda. The initiative of Desperadoes to link with the Emancipation Support Committee to enhance the involvement of steelbands in mas production is to be commended in this regard, and similar initiatives must be encouraged all over. The foreign-based support for Starlift's mas production is another such initiative that must be encouraged and duplicated. All Stars has also begun to do likewise. Tell Mr Affong to listen and listen well. We are about to reaffirm our Carnival space and we shall blow down all attempts to stifle and limit us. The injection that Carnival will get from the enhanced involvement of the steelbands will restore the long lost creativity with which only Minshall of the middle-class lot seems to have any affinity. In like manner, it is interesting to note that calypso itself is about to get a shot in the arm from another source Christian youth. The gospel-calypso tent has, by far, some of the best structured calypsoes heard for quite some time. And they are making a pitch to reach the Savannah. Watch the one called Professor. There is a new level of aggressiveness being exhibited by non-conformist Christian youths that obviously has come as a reaction to the non-Christian militancy in the society. It is clear that these youths shall form the bulwark in the resistance to all forms of religious fanaticisms. Their carefully designed and calculated intervention in this coming Carnival needs to be noted and explained. If they serve to affect the direction of calypso as the steelbands will surely affect the creativity of mas, we may be due for quite some interesting times.